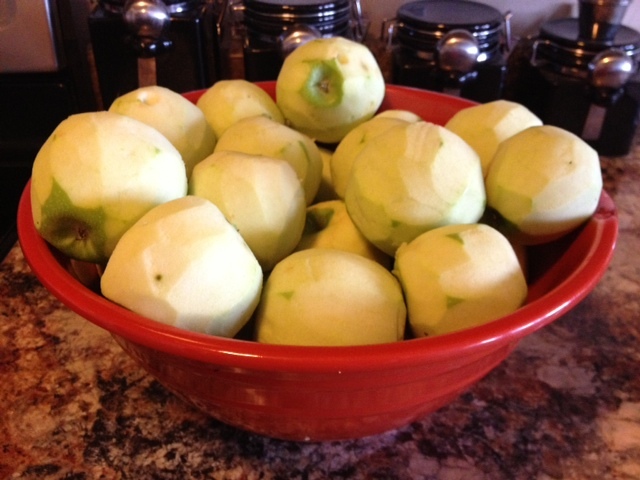 After receiving about 11 pounds of apples from my parents (which is really not a lot considering they had about 4-5 large laundry baskets full of apples they had picked from their apple trees) I was left with what to do with 11 pounds of apples. 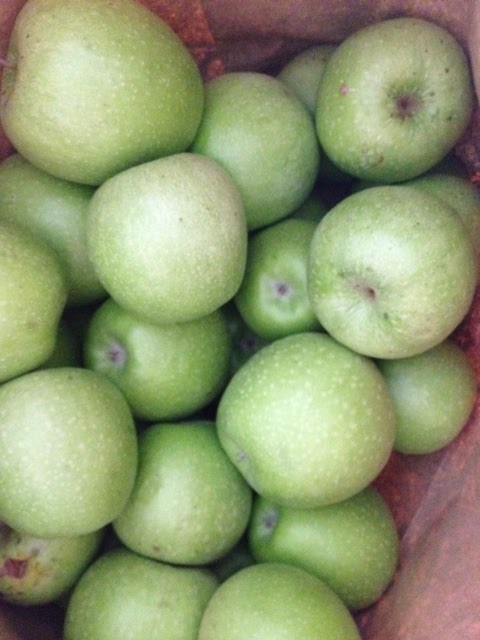 I love apples, but I knew with that many apples we were bound to have some casualties. 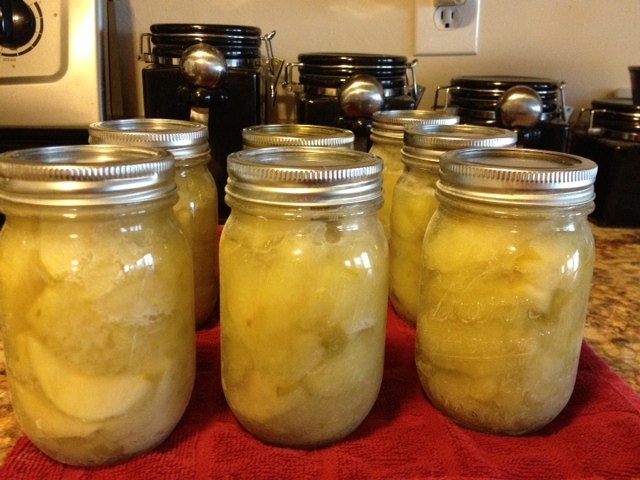 So, in my efforts to abstain from wasting any precious fruit, I decided I would attempt canning them. My first step, was to call my mom…but, oh wait, she is in Tennessee. So, I soon realized, I was on my own. Okay, Plan B. I grabbed my has-never-been-used-because-I-have-my-mom Ball Blue Book Guide to Preserving book and began searching for recipes. I came across a very basic recipe, because basic was a requirement. I began the first step (according to the book) of washing, peeling, coring, and slicing. Do not be disillusioned into believing this is one step. 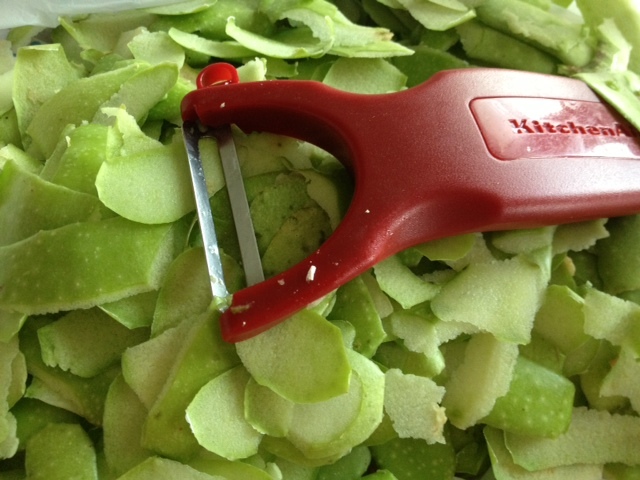 The peeling and coring/slicing should each have their own steps. 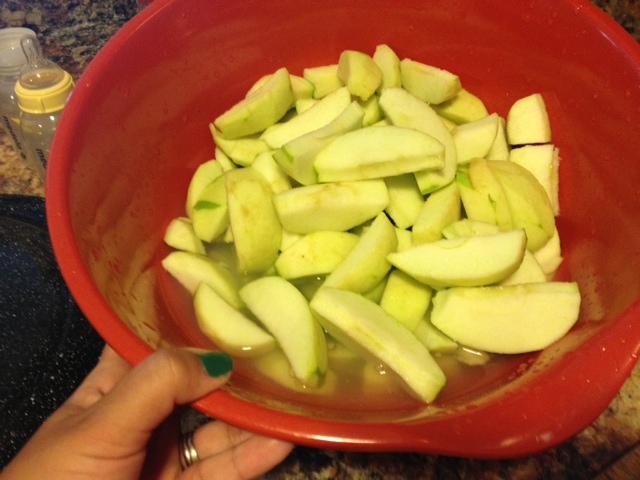 My fingers felt like eagle talons after I was done peeling all those apples. They will never be the same, I am sure. Maybe I need a better peeler??? I have the slices soaking in part lemon juice and part water to prevent browning. The next step, a sticky mess. I had sugar water going every which way. I think I need a saucepan to do this step. However, I was confused when reading the directions initially…so a pot is what I used. The fun was just getting started. Ladling the apples into the jars was the next pleasant, sticky part of this process. I had a mess; I hate being sticky. When the directions told me to “remove the bubbles from the jar”, I wanted to cry. I had no idea how to do that. I looked through my pile of canning tools that my mother had given us and found the one thing I could not identify. After reading a little more in the book; I assumed that this tool was going to help me get the bubbles out. 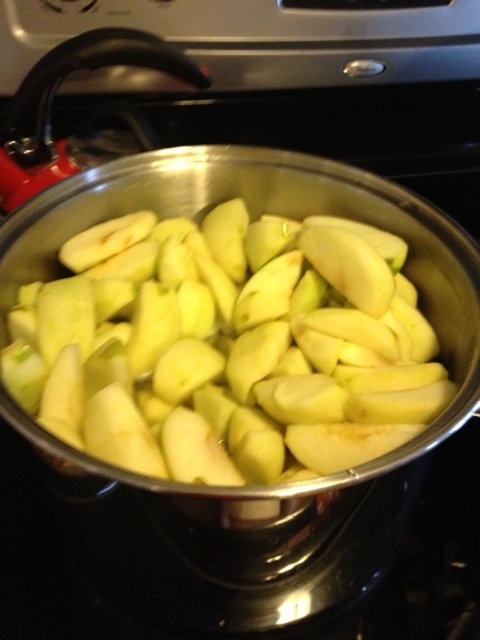 Once it was all said and done – jars filled, rims wiped down, lids placed on, and then jars being immersed in boiling water for 20 minutes…I finally had my canned apples. My “simple” project, complete. 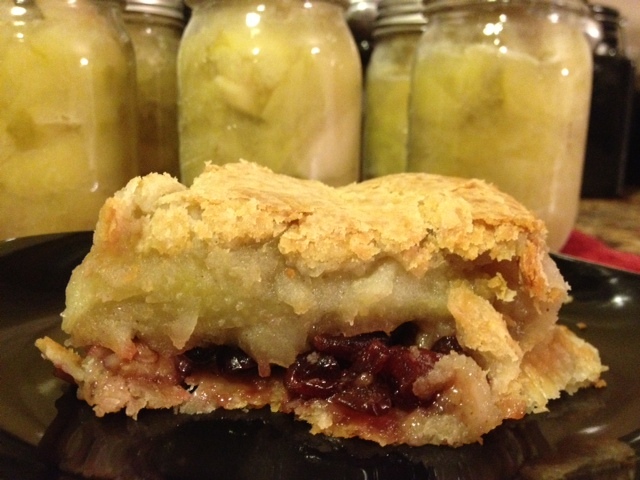 I even had enough leftover to make an apple-cranberry pie for The Hubby. 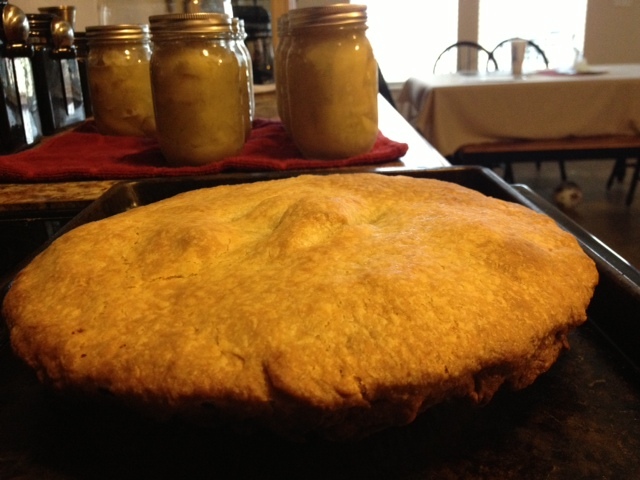 Don’t judge the appearance of the pie. I don’t make pies, my aunt Glenda is the pie maker of the family. It may not be pretty, but it was tasty. 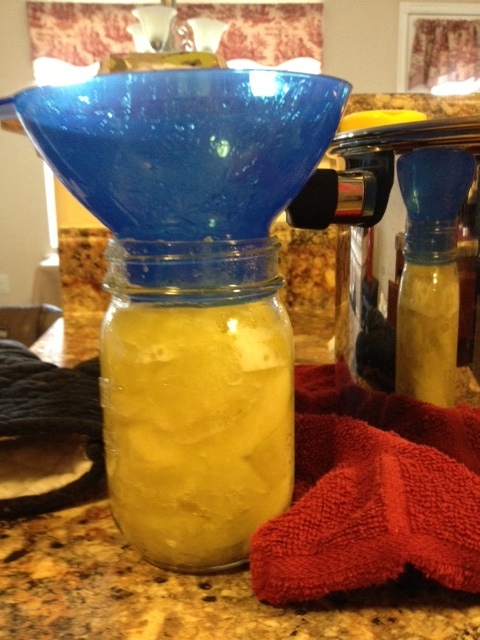 I am thrilled that I was able to do some canning on my own. Next time, I will make sure my mom is fully accessible so I can have her help me. 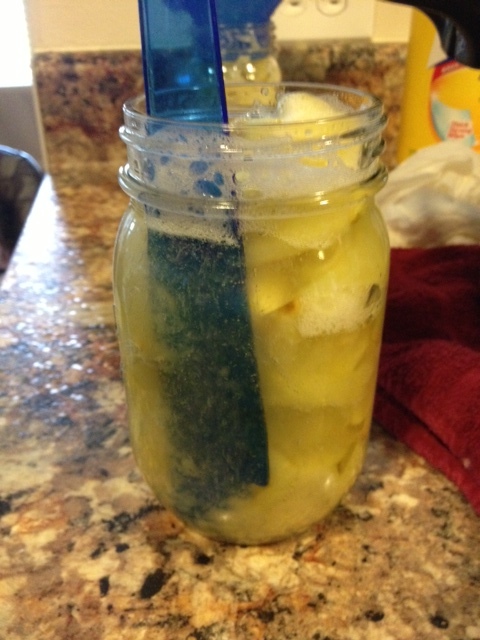 If the “basic of basic” recipes was challenging…seriously, Mom, you are canning with me next time.